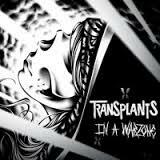 Transplants are back with a new album, called In a War Zone . I’ve always been a fan of the multi-genre project of Travis Barker, Tim Armstrong, and Skinhead Rob. This new album is primarily punk rock, as opposed to the heavily rap influenced Haunted Cities album. There’s a few hip-hop tracks, but this is something to rock out to, and it is going in my weight lifting mix. I don’t see a big single like “Diamonds and Guns” or “Gangsters and Thugs” surfacing (especially not under Clear Channel), but I don’t think that was the point of this album. Listen for yourself, as I have shared with you the title track, “In a War Zone”.